This children’s book is over the top with both scientific information about our planet, as well as humor, adventure, and a lot of silliness thrown in. Imagine something from another planet that lands, appears to be a dog to some, a small person to others, and is here to help save the planet. You get the idea – a big mix of everything. Throw in a grandpa who’s facing serious memory loss, and then the human element becomes quite important. This children’s book is a unexpected read, as it bounces from humor and the improbable, to the pathos of a young boy who misses his grandpa. 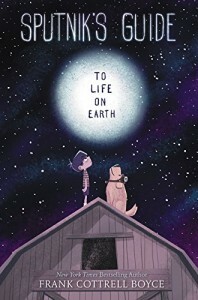 The book works especially well for those kids who are into space exploration or science in any way. The story also starts to make the reader think — what is special about life on Earth? What is it that makes humans and their planet worth saving? Is this hypothetical–alas, not really. Does the book give serious answers? Perhaps not, but it opens the door for wonderful conversations about the whole subject. A terrific children’s book, and one especially nice to share with grandchildren.